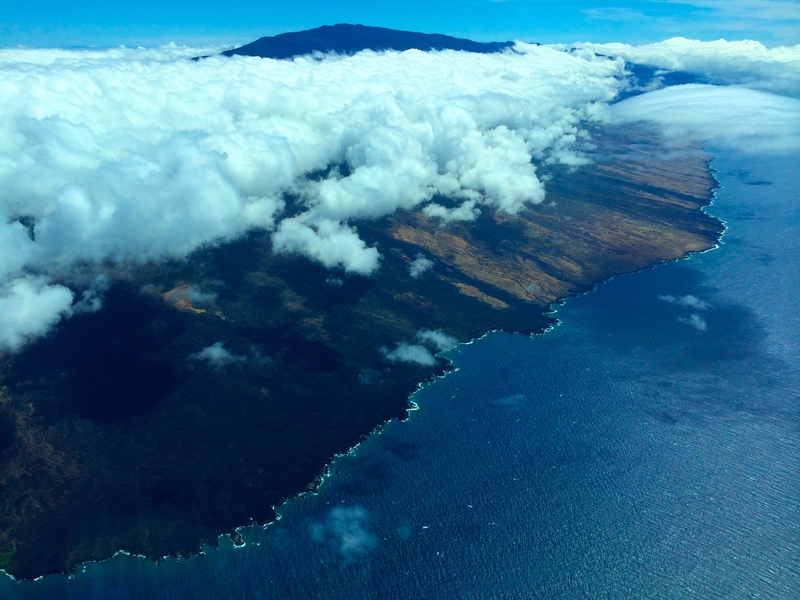 The forty-five minute flight from Waimea to Kahului was one of the most visually stunning experiences I have ever had. First to see the dry landscape and deep cracks in the Earth on the Big Island, then the turquoise coastal edge before a vast expanse of deep blue water flecked with whitecaps far below. 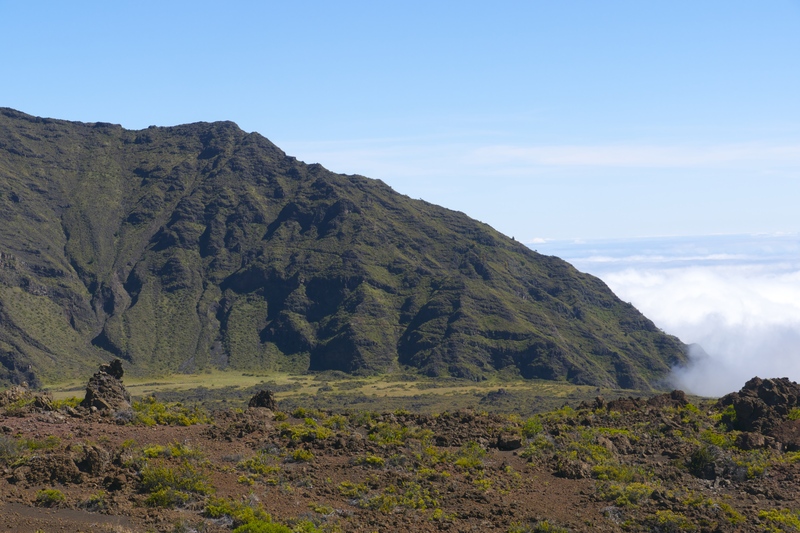 Then, through the clouds, the peak of one of Maui’s mountains became visible, deep green slopes descending down into plains planted with pale sugar cane. We were coming to Maui for just four days to spend some time camping with a couple we know from our graduate school. Maui feels palpably different than the Big Island, its age as one of the older islands in the Hawaiian chain immediately apparent. The soil is of a rich red color, and the shape of the mountains are clearly eroded from eons of rain descending on their slopes. After picking up supplies in Kahului we drove to Lahaina to meet our friends for lunch. Lahaina is definitely a tourist town, packed with overpriced shops, restaurants, and cafés—beautiful and inviting, yet somehow exhausting all the same. We were excited to leave and drive about half an hour up the coast to Windmills Beach, where we set up camp among the ironwood trees right by the water. It was a soft, white sand beach, with sheltered pools to dip into the ocean water. We sat around a fire late into the night, drinking beers and gazing at the stars, talking about all the experiences we each had already had. The following morning, after a leisurely swim at the beach, we made our slow, scenic way up Haleakala, the East Maui Volcano. The four of us stopped in at the visitor’s center to get our camping permits, and then parked several miles further up the mountain at the Halemau’u Trail Head. As we made the finishing touches to organizing our gear we conversed with the other groups of people in the parking lot, some of whom had just returned from a full twelve-mile day hike across the crater and back. One of them opened the trunk of his car and brought out several green coconuts from his backyard, which he cut open with a machete and shared with all of us. I realized it was the first fresh coconut we had eaten since coming to the islands, and it was perfect to consume before setting off on our trek. We also shared a whole pineapple, and some papayas and lilikoi, before departing with bellies full of water, fruit, and optimism. Although it was warm and sunny in the parking lot, about ten minutes down the switchback trail into the crater we encountered a wall of dense cloud, and soon our vision was limited to just a few feet on all sides. The path cut back and forth across the face of the ridge, but we had no perspective on where we were going, or even really a sense of what we left behind as we passed through the landscape. The hillside was covered in vegetation, red and green ferns dominating the slopes. Every so often a nene, the native Hawaiian goose, would startle from a bush up ahead and fly across our trail. The world was eerily silent, like the dense fog was pressed against our eardrums. Soon we were drenched, moisture dripping from our hair and rolling down our faces and limbs. It was hard to tell how far we had come, and we had no idea how much further there was left to go. Suddenly, a bottom was in sight. It came completely unexpectedly. First the dim thread of a trail seemed visible, and soon a pale green field began materializing. The fog became less dense, the path ahead more clear. Before long the last switchback was in sight, and the mountain path ended in a gate that opened onto the flat bottom of the crater. We passed through the gate, closing it behind us, and began walking through a field of tall, wet grasses adorned with sprays of delicate yellow flowers. The mist was rapidly evaporating as we continued on our way. 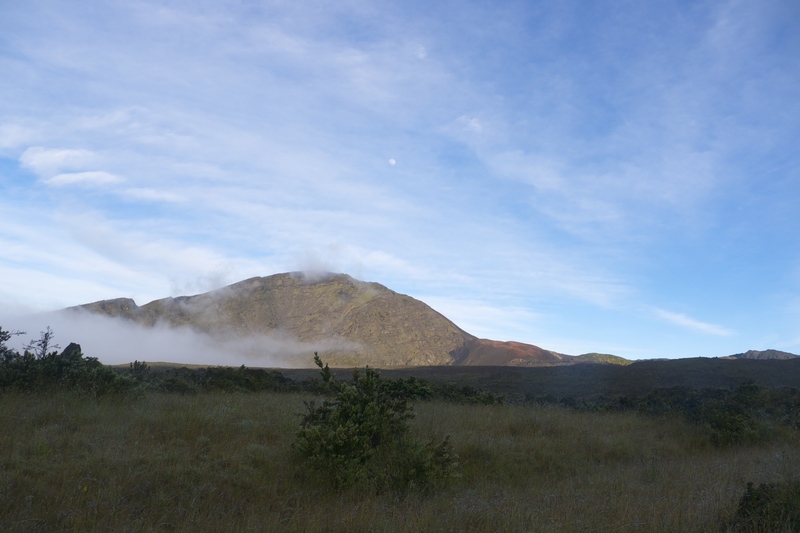 To the left was one of the many cinder cones inside the Haleakala Crater, and the Moon, nearly full, had risen like a pale pearl in the now darkening sky. The path before us began to ascend gently, winding through a’a lava rocks and rough vegetation. After about a mile, the four of us arrived at our campsite, which was just a little round clearing amongst the brush and lava. Another group of campers was set up nearby, and a pair of hikers came in not long after us and set up in the distance. The Sun had set some time before behind the ridge we had descended, but streaks of bright pink still adorned the sky to the north. The light of the Moon dominated the scene, becoming ever brighter as the rest of the landscape faded into darkness. As night descended the sounds of nene and other birds began to echo all around, a soft cooing emanating from the dry foliage surrounding us. Looking south we could see the two bright stars Alpha and Beta Centauri, which Matt and I had also viewed from the heights of Mauna Kea. Yet we could also observe the slight difference in latitude between the Big Island and Maui, because while we had seen Alpha and Beta Centauri from both islands, the Southern Cross was only visible from the Big Island, the one place in all the United States from which that constellation can be seen. The heat of the early morning Sun awakened us and coaxed us forth from our little tents. Our plan was to hike for a couple miles further into the crater before packing up the tents and returning up the switchback trail. The path into the crater led over more rough a’a lava toward the part of Haleakala where the Sliding Sands trail leads. The pu’us in this part of the crater are an array of red, black, orange, and ochre sands, seemingly drizzled over each other to form a desert landscape reminiscent of the surface of Mars. The central field of the crater looked like a sea of blackened waves, frozen in time. 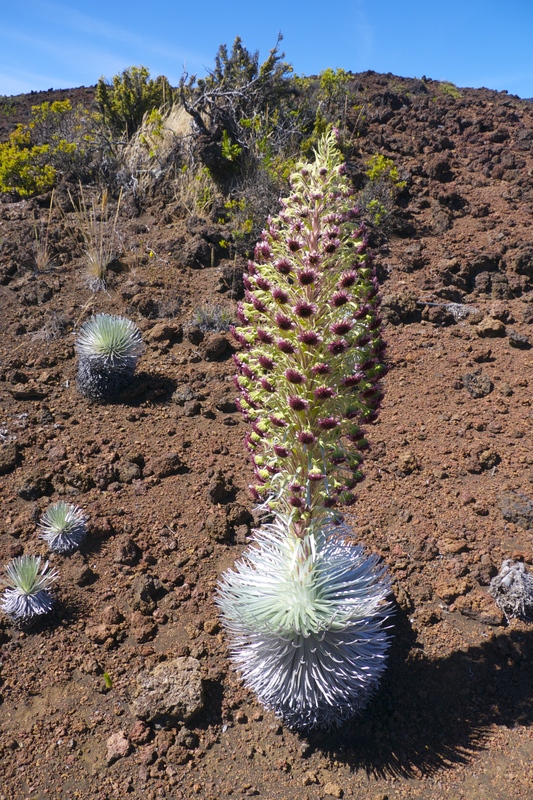 Off of the main path to our left we came to the Silversword Loop, a section of trail that passes a cluster of silversword plants, a species endemic to the mountain heights of Maui. The silverswords have long pointed leaves that are a pale green silver hue. Many of the silverswords on the loop were in bloom, with countless bees humming around their dark magenta flowers. The smell of the blossoms is like honeybush tea, sweet yet subtle and inviting. Eventually we turned back, packed up at the campsite, and headed up toward the switchback trail. The Sun had been blazing all morning but we could see a bank of clouds in the distance and felt sure that we would be mired in fog as we had the day before. Ascending the switchback at first was not nearly as challenging as I expected, and I even said so to Matt. We had already ascended hundreds of feet above the crater floor and were still in good energy and spirits. The bank of cloud kept approaching, yet also appeared to be maintaining a good distance. The view with each rise in elevation was spectacular: first we were overlooking the inside of the crater where we had spent the night and then, as we rounded the other side of the ridge, a new view leading all the way down to the ocean opened up. Even though we were walking the same trail as yesterday the experience of it with clear skies and sunlight was utterly new and exciting. It soon became clear that the fog was not going to encompass us, and that the rest of the hike would be under the penetrating heat of the Sun. Suddenly the switchback grew steeper, at times even becoming stone steps. One section of the path ran across the top of a ridge connecting two larger slopes, and there was nothing but open air on either side of us, a narrow bridge on top of the world. About a mile and a half from the parking lot we ran out of drinking water. The view was still beautiful, but the end of the trail felt like it would never come. Sure that we were nearing the end of the hike we passed a sign: Park Road – 0.7 miles. From our situated perspective that seemed an eternity away. Yet of course the trail did end, and we emerged hot and sweaty, coated in dust and exhaustion. We had no water in the car, but fortunately something even better—a cooler still filled with ice and cold beers. We lay on the ground for a long time just drinking beer, amazed at what we had accomplished. After a good amount of time resting, the four of us left Haleakala behind and headed into Paia, a little hippie town to the east of Kahului. Completely exhausted, we chose not to camp, but rather find a room at the Rainbow Surf Hostel, whose manager is a recent transplant to Maui who spends his days interacting with, to use his words, all the “awesome” guests that pass through his domain while playing covers of ‘90s female musicians on his guitalele, a cross between a guitar and a ukulele. Still exhausted, we treated ourselves an epic meal at the Flatbread Company, which serves locally brewed beer and organic pizzas. The four of us stayed up late playing music and talking in the coconut-shaded courtyard of the hostel. About mid-morning we left the hostel to spend our final moments on Maui at Paia Beach, and then Matt and I bid our friends adieu and set off for the airport. I can certainly say four days is not enough time to spend on Maui, and that I hope to return sooner rather than later to explore the road the Hana, the Seven Sacred Pools, and many other places that I have yet to hear of. The flight back to Waimea was just as beautiful as the flight to Maui, and this time we were graced with a rainbow arcing through the clouds beneath the belly of the plane. One of my uncles met us at the airport and brought us back to rest at his house where we could just relax and unwind from all of our adventures. With only three days left in Hawaii we decided to spend the remainder of our time moving at a slow pace and just returning to our favorite places in the area. In the morning we helped my beekeeper uncle sell honey at the Waimea Farmers Market, then spent the rest of the day at Mauna Lani Beach lying in the Sun and floating on the peaceful waves. The following day we learned how to harvest bananas from my uncle’s trees, then spent the late afternoon at Mauna Kea Beach, which I must say is my favorite beach we visited during the entire three weeks. The white sand beach is curved in a gentle crescent, and the surf is simultaneously perfect for body surfing and for just floating calmly. That night Matt and I cooked Thai green curry as part of a dinner to show our deep gratitude to my two uncles, who really made this trip possible for us by giving us a place to stay and a van to take around the Big Island. For our final full day Matt and I returned briefly to Honaka’a, then went back to Mauna Kea Beach to body surf and eventually watch our last Hawaiian sunset. We went out for sushi near Mauna Lani, and then met up with my cousin and her boyfriend for a final dip in one of the resort pools and hot tubs. Three weeks can seem like a long time, but when you are in a place as rich and diverse as Hawaii it seems to go by in half a heartbeat. Yet how much we had experienced; indeed how much we had been changed in so many deep and beautiful ways by this experience together. I want to learn how to hold these experiences within me in such a way that I can draw on them for strength and inspiration when I need them. And yet, as much as I hope to embody as fully as possible the transformative power for growth and healing that Hawaii can offer, I also cannot help but ask, when can I return? Fun times Becca! The rendition was awesome; everything flowed together quite nicely, as though I was there on foot.